3 Stubble fields located beside a known Pictish area and an old Kirk near the Angus town of Brechin. Please arrive at 0845 for a 0915 start. Farm is Mains of Aldbar. Nearest postcode is DD9 6SJ which takes you to a location just below the dig site. Take the A90 Dundee to Brechin road and take the Southernmost turnoff for Brechin ( A935 signposted Brechin, Montrose and Arbroath) . Approx a mile and a half along this take the right turn B9134 signposted Aberlemno. 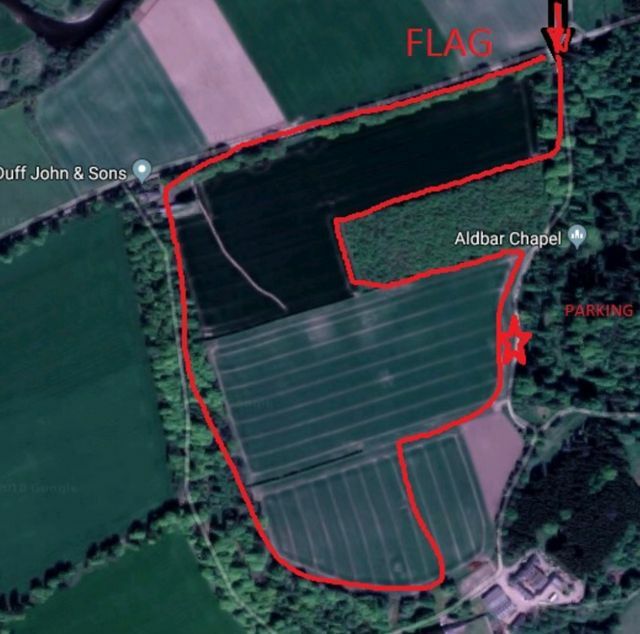 Follow this road approx a mile and a half over the bridge of stannochy and on the left set in by some trees is an ornamental set of gate piers for a castle (Aldbar Castle) the flag will be sited here, We will park here close to here. Fields have never been touched by myself and are being ploughed this week coming so is a last chance for the season. Jim tested them with the spade today and there’s a crust but it’s diggable due to the stubble not freezing hard in the same way pasture does. Myself and Tracy please guys....Ta much. Put my name down please, Thank you. Visited farm today. Looks great. An ancient den and castle sit either side of the fields. Never been done by myself or at a dig. Parking all sorted. I'm a maybe - depends if wife needs to take the car somewhere. Just bring her  problem solved..
Can you add ne please?